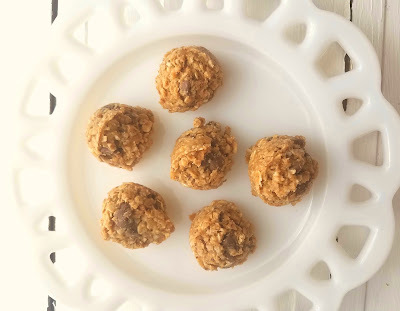 Protein Power Balls or Energy Snack Bites are easy to make and give you a quick, boost of energy just when you need it! Do you find yourself spending money on protein bars? Do you want a quick and super healthy snack or breakfast for you or your "on the go" family that they will love? If you haven't yet been introduced to no bake power balls let me get you started! I've got two recipes for you, but once you make them you can really start playing around with them. Get creative like adding sunflower seeds, dried fruits, the list goes on and on. I first ran across power balls years ago, with my daughter, in a magazine. She was playing volleyball and basketball and these were a great way to give her some energy and nutrition. Later her brother started playing football in high school, and he really struggled during those hot, humid, southern August summers to keep any kind of food on his stomach. I went back to these power balls and found them to be very helpful. When I went to make the first recipe, I grabbed my son's soy protein powder and to my dismay it only had one scoop left. 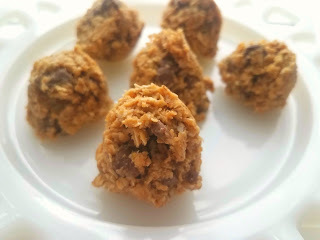 So I've made a third of the recipe in the photos. oh these sound way better than the protein bars I have. How do these hold up in the summer when you are carrying them around? Do they need to be in a thermal bag? Great question! They are not all that sticky when they are chilled, but they do need to be in a cooler, a thermal lunch bag with an ice pack if they'll be carrying them around outside. The honey and peanut butter get sticky when they are warm. These look good and I am so tired of store bought protein bars. Will give them a try. Thank you.